We create your project, we deliver your project, so what’s next? Now we can manage your project. We start your account on our mediaCLOUD and deliver a rich media presentation. We can then manage unlimited remote screens, devices, embedded windows on your site, and do it all from Q1 Broadcasting via the internet. Start with our professionally designed layout and customize your content. Add RSS, stock tickers, weather, live TV, layered screen divisions, HD videos, animation and hundreds of other components. Q1 will deliver an engaging presentation to your audience anytime, anywhere… that’s Digital Content Management (DCM). Imagine building your presentation once & running it everywhere; in browsers and PCs, inside tablets and across mobile devices, on Smart TVs and on set-top boxes. Now stop imagining, it’s all possible and you guessed it, all managed by Q1 Broadcasting. That’s because at Q1 Broadcasting we work hard to make sure you can run your presentation everywhere, without having to recreate any work. Our mediaBOX is the ultimate plug and play, small form factor Digital Content Player. It’s about the size of a couple of coke cans and easily fits behind most flat screen TV’s or power your public broadcast channel so you’ll be ready to enjoy a super smooth presentation. 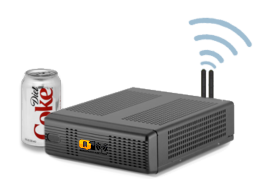 Powered by a Dual Core Desktop processor, Dual band Wifi, HDMI, DVI, D-Port and VGA the mediaBOX can power 2 HD outputs, each running different content. Placing video on the front page with call to action buttons will help customers navigate quickly to items of interest.